Le nom d’un fou s’ecrit partout. One of the more elaborate hambones, this one located in the Carport of Destiny. 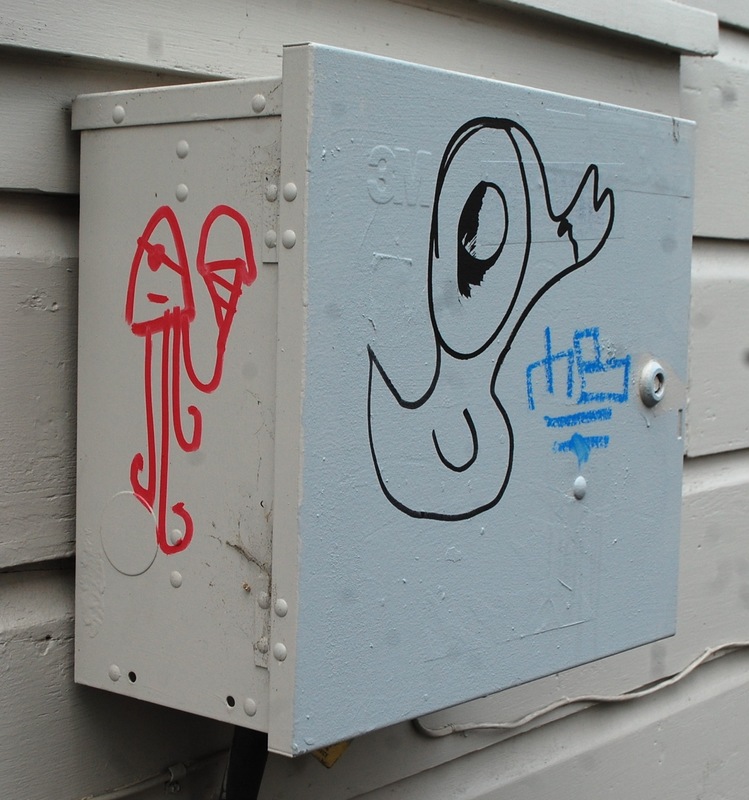 ARCATA – It’s hard to walk anywhere in central Arcata and not come across a spray-painted hambone, octopus or “chaote” graffiti tag. The ubiquitous markings appear on walls, utility fixtures and even sidewalks. 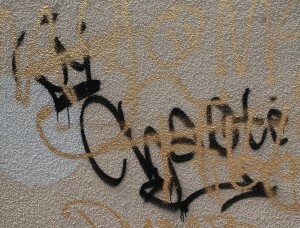 But there may not be any fresh appearances of the pernicious tags for a while, now that police say they have captured the tagger. The octopus holding a hambone sign at 10th and I streets. 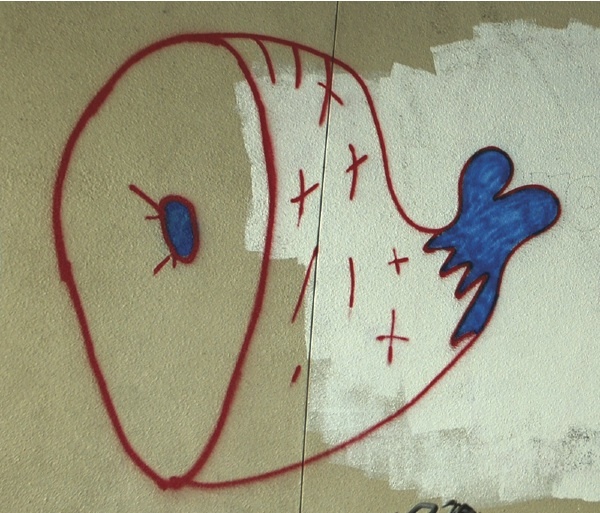 On Tuesday, Aug. 17 at about 9 p.m., a citizen called in a report of vandalism in progress in the 1100 block of D Street, where a man and woman were seen spray painting a sidewalk. Two Humboldt State University Police officers happened to be on bicycle patrol near the old Trinity Hospital building just a block away. They went to the reported location, found and detained two HSU students until APD officers arrived. An octopus/hambone-duck combo on a utility box in a downtown alley. According to police, the 22-year-old woman made a statement incriminating the man, Marc Douglas Cerda, 23, of Arcata. Cerda had wet paint on his pants which matched a fresh “hambone” tag (see above) on the sidewalk nearby. Cerda was arrested and was booked into Humboldt County Jail on suspicion of felony vandalism and possession of graffiti tools, including spray paint. APD Det. Sgt. Todd Dokweiler said the vandalism qualifies as a felony because of the cost of the damage caused by the three different types of tags throughout Arcata. “We’re in the thousands of dollars on these tags,” he said. This "chaote" exemplar has been overtagged. This entry was posted on Wednesday, August 25th, 2010 at 9:13 pm	and is filed under News. You can follow any responses to this entry through the RSS 2.0 feed.